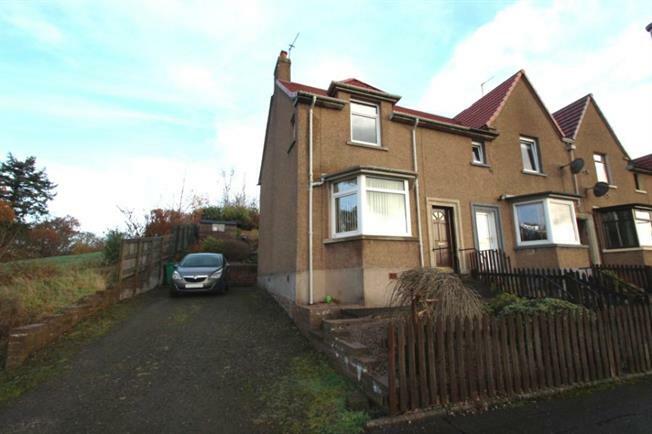 2 Bedroom End of Terrace House For Sale in Glenrothes for Offers Over £105,000. This lovely 2 bedroom end terraced villa is located within ever popular Markinch. Situated at the end of a small cul-de-sac with access to woodland walks, the property is ideally located for Markinch amenities including shops, school, hotels etc as well as the mainline train station and A92 providing transport links throughout Fife and beyond. The property is double glazed and benefits from gas central heating and the accommodation over two levels comprises of entrance hall, lounge with front facing bay window, fitted rear facing kitchen and a useful rear vestibule area with 2 built-in storage cupboards, fitted storage and access door to rear garden. Upstairs are 2 double bedrooms and a shower room fitted with white suite. The front bedroom has a double aspect with windows to front and side and benefits from an array of fitted wardrobes and the rear bedroom has a built-in wardrobe area. Externally, there is a small chipped garden area to the front of property with off-street parking for 2 vehicles to the side. The enclosed rear garden is terraced with various borders, chipped and lawn areas.